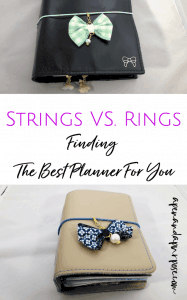 Rings Versus Strings: Which Planner is Best? Traveler’s notebooks and ring bound notebooks both allow you to keep a lot of stuff with you on a daily basis. Whether you do planning, note taking, journaling, bullet journaling, or art; each option is great for your needs. I did some research while choosing one for me and am sharing the pros and cons of each. Traveler’s Notebook Or Ring Bound Notebook? I’ve never been a fan of 3 ring binders or any ring bound notebook for that matter. Yet, after people posted pictures of their Foxy Fix ring bound notebooks on Facebook, I started to consider ordering one to try it out. I’ve been using a Traveler’s notebook for a while now for bullet journaling and general note taking, but there is one thing I’m finding difficult about it. I can’t get it to lay open and flat on my desk while I am using it. When I’m working on things, I like to have my to do list sitting in front of me so I’m constantly reminded of what I need to do next. With the regular traveler’s notebook, I have to open the notebook every time I want to see my list. This has also been annoying when taking notes on something. I need to open it back up every time I want to write something down. Part of me feels I must be doing something wrong since other people write in their traveler’s notebook when on the go. I think I would find it too hard to manipulate all of that. This is problematic for me because I’m super distractible and when I need to open my book to find my list I also start looking at other things. I’ve purchased this music book holder to hopefully help me with this issue. It seems like it might help, but then I have to move it every time I want to turn the page. I also have to remember to bring it with me! In the meantime, I’ve ordered the Spice Pepper Rings in Personal Wide from Foxy Fix, which I received this week and wanted to share with you my thoughts as well as the thoughts of others I found on the internet to help you to decide which is better for your planning and note taking. 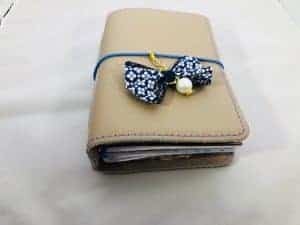 With a traveler’s notebook, you use several separate little books, or inserts that you place in your notebook that are held in by an elastic string. You are able to keep things very separate by having them in different inserts. There are lot of options on Etsy and other places for different size notebooks. Here’s an example of a pretty one. You can stuff the heck out of these. You can use a jump band to put extra inserts into your notebook. For instance, I have a compact notebook from Foxy Fix (pictured above) which has four strings. In it I have a wallet, seven book inserts, and two dashboards and it does not appear stuffed. I could certainly add more stuff in there. Because there are no rings in the way of writing, you are able to write on the full sheet of paper, allowing you more space to write. The notebook does not lie flat when on your desk. You have to hold it open while writing. I’ve seen some complaints about the string in the middle of the notebook. People claim it leads to a lump making it hard to write. I have not noticed this myself at all. You can move the pages around. For instance, if you accidentally write your work notes in your blog notes section, you can just take the page out and move it. You can write temporary items such as shopping lists in your notebook and not have to keep them forever. Rip them out and use them. I also liked this because I would not pull out my entire traveler’s notebook or insert while grocery shopping, but would use just one piece of paper. There are times when you do not need a full notebook for a type of task. Let’s say you keep something like a list of books you are reading in your notebook. You may only need a page or two for that rather than a whole booklet. The ring system allows you to do this. An email you want to save and respond to? Print it out, punch the holes, add it to your notebook. The rings limit the amount of things you can put in your notebook. If you put too much in there it is hard to turn the pages or to open and close the rings. Rings add additional weight to your notebook. Rings get in the way of writing. As a right hander, my hand runs up against the rings when writing on the left side page. Some people find this so annoying that they have to take the paper out to write on it. I haven’t been too bothered by this but I’ll have to use it for a bit longer to see if it will annoy me. It may be more difficult to store the pages you want to keep. 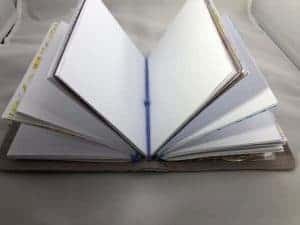 With a notebook, it all stays in the book but in the rings they are all seperate sheets of paper. So there you have it. There are pros and cons to both systems. They key is figuring out which are most important to you. I am currently using the rings I purchased because I like that the notebook sits open on my desk. I didn’t even know this was a bit deal to me until I found I was not using my traveler’s notebook as often as I’d like because it felt like too much work to open it all the time. That said, I’m not giving up on my traveler’s notebooks yet. I love the concept and the seperate inserts. Since I am new to the ring system, I will have to update as I use each a little while longer. Which do you prefer? Leave a comment and let me know.